The annual gathering of the most influential Zionists in the US appears to have lost much of its swagger after several leading Democratic presidential candidates ducked out of this year’s event of the American Israel Public Affairs Committee. Even one of the most influential donors to the powerful pro-Israel lobby group was absent after being taken to task for sending out a string of hate-filled tweets aimed at two of America’s rising Muslim politicians, Ilhan Omar and Rashida Tlaib. Adam Milstein was left out in the cold after being challenged over a series of hate-tweets he sent to Somali-born Omar and US Palestinian Tlaib. This is not the first time he has apologised for the content of his tweets. In 2017 an anti-semitic graphic targeting liberal Jewish philanthropist George Soros was sent which fuelled speculation about a growing affinity between the anti-Semitic far right and Israel’s staunchest backers. Journalist Max Blumenthal exposed the offensive Milstein tweet, which depicted the face of Soros superimposed on an octopus straddling the globe. The new congresswoman Omar, a Democrat who arrived in the House last year, has faced many accusations on anti-Semitism after she revealed she felt pressured to pledge “allegiance” to Israel. While she has apologised for some of her comments to the surprise of veteran politicians on Capitol Hill Omar has received an overwhelming amount of public support for her congressional work. As a result, earlier this month, a resolution in Congress condemned both anti-Semitism and Islamophobia, equally, including particular reference to the invocation of dual loyalty. The arrival of the new, outspoken young female politicians on Capitol Hill appears to have had a negative impact now on the influence of lobby groups like AIPAC. Vermont Senator Bernie Sanders has already expressed his “concern about the platform AIPAC is providing for leaders who have expressed bigotry and oppose a two-state solution” with regards Palestine, according to an email sent by his campaign policy director, Josh Orton. Representatives of Senators Kamala Harris and Elizabeth Warren, former Representative Beto O’Rourke and South Bend, Indiana, Mayor Pete Buttigieg and Julián Castro are also swerving the conference, which began today (Sunday) in Washington. While they’ve not given a clear reason for being ‘no shows’ John Delaney, another 2020 Democratic contender, said a scheduling conflict would cause his absence. US President Donald Trump has previously accused Democrats of being “anti-Israel” and “anti-Jewish.” Both he and Israeli Prime Minister Benjamin Netanyahu who is facing corruption allegations as he’s running for re-election are scheduled to speak at AIPAC. According to the three-day schedule New York Representative Hakeem Jeffries, a member of the Democratic House leadership, and Senate Majority Leader Mitch McConnell will both address the conference despite tailing off of support for the pro-Israel lobby group. Meanwhile, Republican National Committee spokesman Steve Guest says Democrats are showing “transparently anti-Israel bias” citing the absence of the Democratic presidential candidates at AIPAC and a call by progressive activist group MoveOn and Jewish Voice for Peace for them to boycott the conference. Zionist fanatics are becoming increasingly desperate to silence any criticism of Israel so the absence of leading Democrats, especially presidential candidates will be sounding alarm bells from Washington to Tel Aviv. Israel’s image among the general population and young Jews, in particular, is in terminal decline, according to a secret report which was leaked in April 2017. The contents, co-authored by Israeli think tank the Reut Institute and America’s Anti-Defamation League (ADL) revealed that while the Zionist lobby had no shortage of funds to spread its pro-Israel propaganda, it was losing influence and sway over Americans. The politicians on Capitol Hill who are often accused of being in the pay and sway of AIPAC and, by extension, Israel, are waking up to this. JVP which says AIPAC is “morally bankrupt” as well as being the biggest obstacle “to justice and equality for all in Israel/Palestine”, launched a billboard and advertising initiative across Washington urging US politicians to boycott the event, hence the hashtag campaign #skipAIPAC. Its most powerful tools appear to be the words of Israeli leader Benjamin Netanyahu who recently tweeted that Israel is a “Nation-State of the Jewish people and them alone.” How ironic is that? With 20 per cent of the population in Israel being Palestinian he’s just ramped up the accusations that Tel Aviv is running an apartheid state. Jewish Americans have overwhelmingly backed Democrats in presidential elections for decades: Hillary Clinton won 71 percent of Jewish voters in 2016, according to exit poll data compiled by the Pew Research Center. 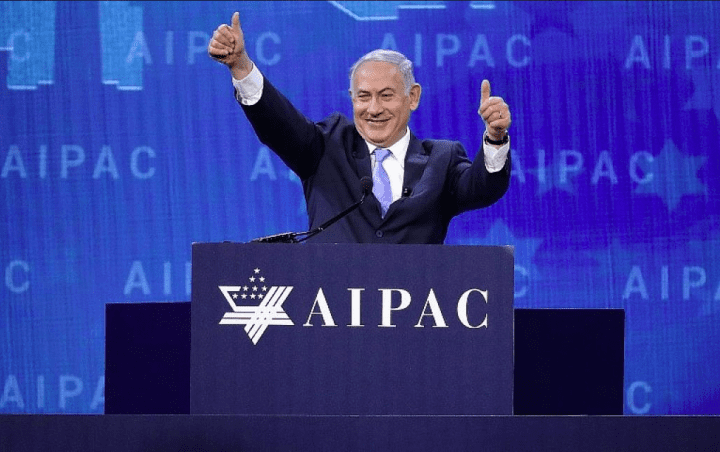 Democrats have carried Jewish voters by anywhere between 39 and 60 points in White House races since 2000 and, judging from the reaction towards AIPAC by some in Washington, the anti-Israel sentiment created by Netanyahu’s right-wing rhetoric appears set to increase.